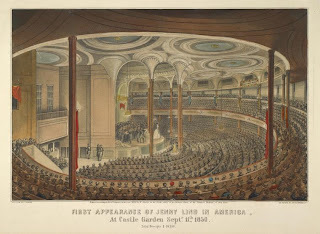 For all her demure religious virtue, Jenny Lind must have been quite the business woman. 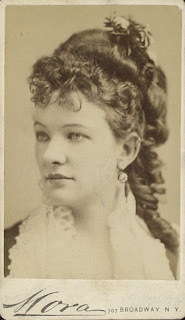 The deal she negotiated for a concert tour of America with P. T. Barnum included all her expenses as well as a $1000 per concert fee- a staggering sum at the time. 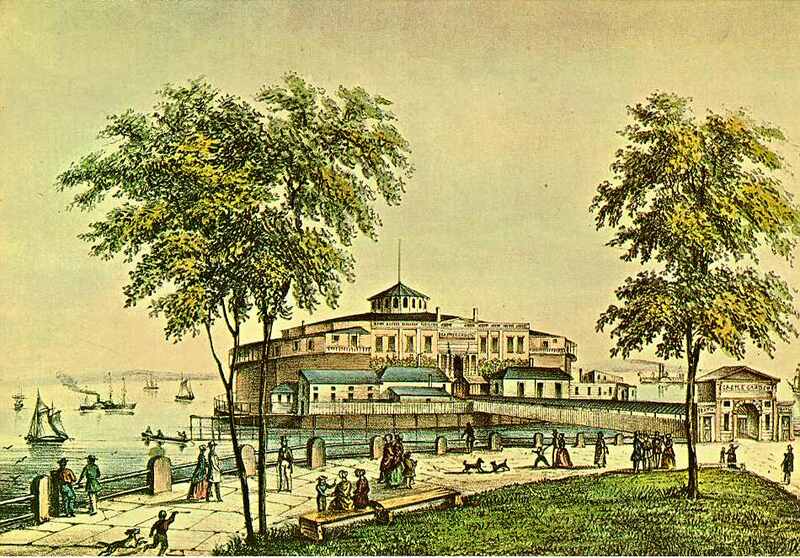 She arrived in New York in 1850, and was met at the dock by 40,000 people. 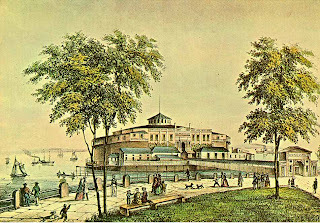 Her first concert - for charity- was at the Castle Garden Theater which was located on an island off the southern tip of Manhattan. Originally a fort in the harbor, the structure is now a national monument and is surrounded by landfill and part of Battery Park. Visitors to Ellis Island know it as a ticket booth, and the only evidence of Lind's famous concert is a plaque inset into a wall. Probably old New York has never before or since witnessed a more magnificent scene of beauty and splendor than that which greeted the eye upon this occasion. Looking down from a niche high up in the balcony, the scene to the writer was one never to be forgotten in its rich and bewildeiing beauty. All of the wealth, the taste, the beauty and cultivation of New York's best society was there resplendent in color and glowing with gorgeous magniflcence. The splendid costumes, the rich and varigated colors, the lovely roses filling the air with a soft and delicate perfume, the flashiug jewels and sparkling eyes,—the speaking looks, movement and action, all blending with the subdued murmur of animated voices, made up a scene of fairy like enchantment rarely witnessed more than once in a lifetime, and those who were so fortunate as to behold it will carry it in their minds as a souvenir of memory never to be forgotten. As the time for opening the concert drew near the audience became hushed in mute expectation. At length the supreme moment that they had so anxiously looked forward to arrived. Signor Benedict came quickly forward and took his place at the piano; and a moment later a fair girlish figure glided gracefully forward to the front of the stage and bowed. The vast audience was hushed for a moment and then burst forth in a prolonged thunder of applause. This was so loud and vehement that its effect was to overcome and disconcert the fair singer for a few moments, as the first notes of her "Casta Diva" were a little tremulous and unsteady. But as it progressed her genius reasserted itself and her voice rose steady, clear, strong and vibrant,—full in volume, immense in compass, and under perfect control. Its reverberations filled every corner of the immense building, ringing brightly out from the dome above and sounding distinctly over the waters of the surrounding bay. During the progress of the song the house was "hush as death," but when the last notes died away, the pent up enthusiasm burst forth in repeated and prolonged applause; nor did it cease until she had been repeatedly led forward and deluged with boquets, during which the wildest enthusiasm sought expression in the waving of handkerchiefs—the tossing up of hats and some of the madest antics that enthusiastic frenzy could be capable of. There was but one voice in all that fabel of voices and that was the voice of applause. Irresistable expressions of astonishment and delight escaped from every mouth. 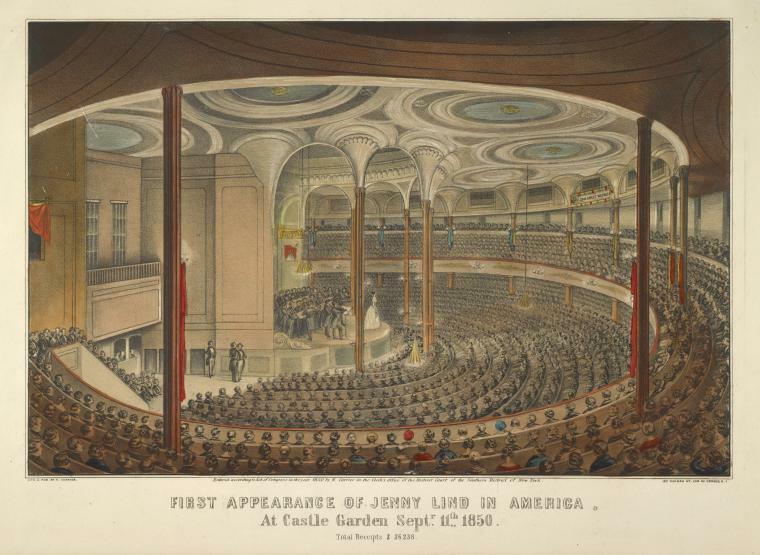 From Music: A Monthly Magazine, 1896, Jenny Lind's First Concert in America by Ira Gale Tompkins. You can read the rest of this fascinating eye witness account here. From Castle Garden, Lind set out on cross-country tour which brought Barnum half a million dollars. Lind reportedly gave most of her quarter-million earnings away. 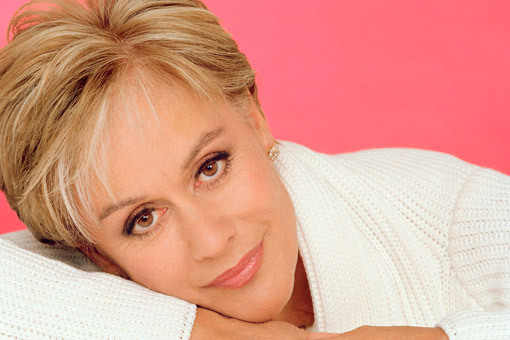 I went to hear Kiri te Kanawa sing Strauss' Four Last Songs at Carnegie Hall a few days ago, and have been sitting on my hands debating whether to write about it or not. Why the trepidation? It's awful witnessing one of your idols crash and burn. Truth to tell: I wasn't expecting the performance in the Utube video below (one should make allowances for the passage of time), but the performance at Carnegie was compromised in ways that made me wonder if Dame Kiri was aware of her current limitations. In a work that demands impeccable 'placement,' and is arduous even for those in the the prime of life, I heard only a handful of tones that cut through the orchestra and landed on the listener's ear with a hint of radiant glory. The rest were so carefully produced as to be inaudible. In short: the voice simply wasn't there. A great singer with a once golden voice? I should say that I heard- and saw- one really beautiful tone in the third song. Everything came into alignment. Of course, this needs further explanation. What most people aren't aware of is that the facial nerve is connected to the ear. When the face is 'open', that is, the small muscles of the head enervated, the ear is tuned towards higher frequencies which make ringing chiaroscuro tone possible. This is effected via the facial nerve which goes into the middle ear and stimulates the stapedius muscle and the stirrup, bringing about a posture of the ear as well as the body. What does this look like? The facial muscles looks sculpted while the spine is extended without effort. What does this feel like? To put the matter succinctly: the muscles of the face, front of throat and back of head feel drawn towards the ear, while the upper lip feels wide, and the small muscles surrounding the nose 'busy' (the combined forces of /a/, /i/ and /u/). Then the bones really do sing. For one moment, and in one tone, that is what I heard and saw in Dame Kiri. Barring the Strauss, which is a tall order for anyone, I hope she gets her groove back. His gleaming baritone voice made a huge impression on me when I was in graduate school. Though I have to say; the first time I heard Gérard Souzay, it wasn't a revelation as much as it was a window into a world that was. 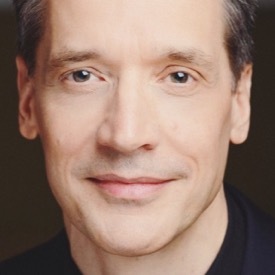 Frankly speaking, when I heard Souzay at a summer Art Song Festival concert at Westminster Choir College in Princeton in the 1980's, it was evident that his voice was in decline. It was only when I later listened to an LP of Debussy songs that I realized why everyone was making such a fuss: Souzay was simply the most elegant singer of his time. What a beautiful voice! His mezza voce singing in the upper range made my hair stand on end. How did he do it? It was only much later that I learned that the secret in acquiring this most beautiful of vocal effects was in practicing messa di voce, first in a comfortable lower range, and then in the higher more challenging range. It's systematic you see. You have to able to do one thing before you can do another. Speaking of which: how does one practice messa di voce? 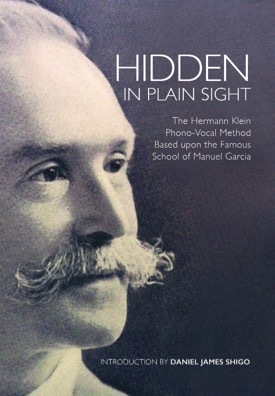 Manuel Garcia taught his students that the way to go about the matter was the artful decrescendo of a full ringing tone without losing any quality. Then one learned how to start the tone with this same quality and increase the volume. Join the two 'halves' of your practice together, and you have messa di voce. If anything, Souzay is exemplary in his shaded, soft singing. You can listen to his art below, or watch him in action here. He sings Duparc's Chanson triste in the latter link - a song that still gives me goose bumps. One more thing about this beautiful singer which is quite evident in the Duparc: Souzay uses his right ear to lead his voice. 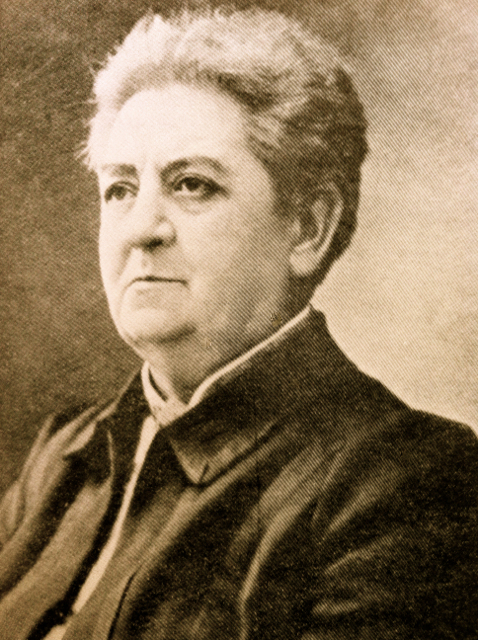 Bianca Rosavella- an American from Chicago who's real name was Blanche Roosevelt Tucker (Roosevelt was her mother's maiden name). She sang in several Gilbert and Sullivan productions and ended up marrying a Signor Marochetti. 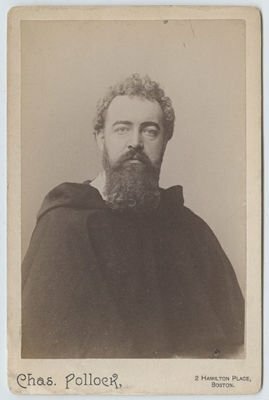 C Harry Meltzer - Bianca Rosavella's defender, who's ad for the translation of Alphonse Daudet's "The Evangelist" appeared in an astonishing number of books. Charles Lunn- A highly regarded voice teacher from Manchester who taught at the Royal Academy of Music, was the author of The Philosophy of Voice (1874), and a friend of Manuel Garcia. Lunn posited that the false vocal folds have as much a role in phonation as the true folds, which was proven to be false. 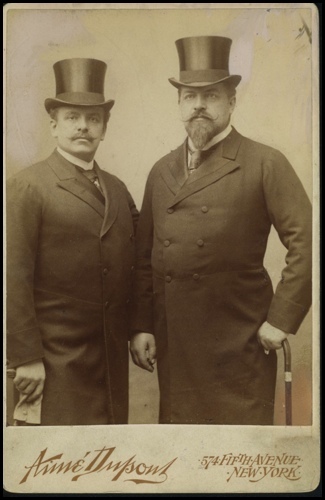 Manuel Garcia and Francesco Lamperti - The two giants of vocal pedagogy in the 19th century. 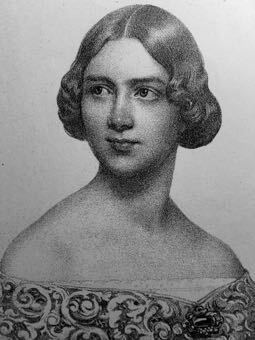 Pauline Viardot-Garcia - Manuel Garcia's sister and legendary singer and voice teacher. 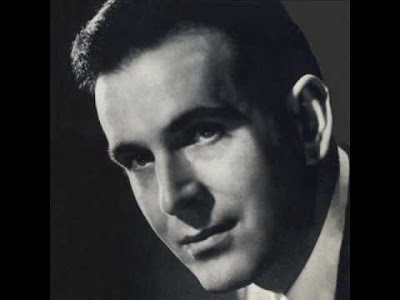 Antonio Sangiovanni - A Milanese voice teacher. Signor Trivulsi- A Milanese voice teacher who instructed the young Francesco Lamperti. MDLLE. ROSAVELLA AND SIGNOR LAMPERTI. TO THE EDITOR OF THE " MU8ICAL 8TANDARD." Sir,—In commenting upon an incident affecting Mdlle. 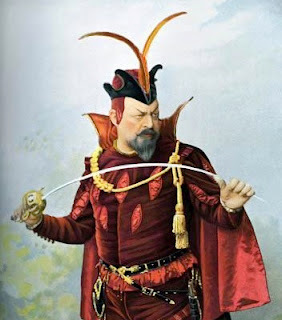 Bianca Rosavella and Signor Lamperti, the well-known Italian teacher, your Milan correspondent was recently betrayed into certain inaccuracies which I would ask you, with your usual courtesy, to give me the opportunity of correcting. Mdlle. Rosavella was sent to Italy by Mr. Gye in order to perfect herself in the Italian language and in singing, prior to making her debut at Covent Garden as prima donna. 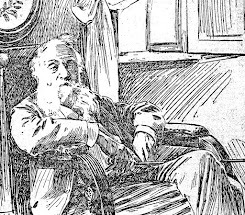 Acting on the advice of the London impresario, immediately on arriving in Milan she applied for instruction to Signor Lamperti, who bears, rightly or wrongly, the reputation of being the first singing teacher in the city; and, after some little delay arising from the master's absence at the Lakes, was admitted to the privileges of the faithful who sit at the feet of the Signor. The first lesson Mdlle. Rosavella took so weakened her physically that she had a severe internal attack. The second did still more mischief, and when the time for the third arrived, she was so unwell as to be obliged temporarily to cease working. Finding that the method she was called upon to adopt threatened to nullify all the hard labours and study of two years; moreover, perceiving it to be at direct variance with the system of the great French teacher, Madame Viardot Garcia (who had given her the rare advantage of her tuition in Paris) Mdlle. 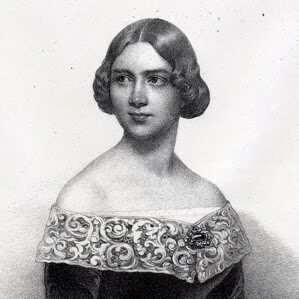 Rosavella ventured to express a fear lest she should be unable to continue her studies on the same principles as certain other singers—Albani, Waldmann, Stolz, Campanini, &c., &c.—mentioned by the Signor as instances of great artists who had come to him utterly innocent of voice or talent, and who by blindly following his method had grown famous. This unprecedented act of rebellion against routine so astonished the maestro that he in a moment of (let us hope) thoughtlessness, so far forgot the rules of ordinary courtesy as to grossly insult his pupil, a young and refined Iady. It is hardly surprising if under these circumstance; Mdlle. Rosavella felt little enthusiasm for master or method. As a matter of fact she took a couple of lessons more before severing her connection with Signor Lamperti, and then finding that to succeed she would be compelled to rejoice in the possession of either no voice or a ruined one (to quote the master's own words) neither of which seemed either desirable or indeed possible objects of ambition to her, she discontinued learning of Signor Lamperti, and returned to Signor Trivulsi, of whom she had already taken several lessons. It is neither my wish nor intention to enter upon any discussion regarding the different methods followed by different teachers. Far from my thought be it also to insinuate that Signor Lamperti does not unite to the wisdom of Solomon the patience of Job and the versatility of Paul, who, it will be remembered, was "all things to all men;" but still would I respectfully submit that the doubtless honest censure passed upon Mdlle. Rosavella by your Milan correspondent, is decidedly out of place, and might with fitness have been spared. The reason of his mistake is found in the very letter of your correspondent itself, for therein it is distinctly evident that the information communicated to you was obtained from third parties, who had possibly some interest in misleading your correspondent. Be this as it may, as a friend of Mdlle. Rosavella, well competent to speak with certitude as to the facts of this affair, I should be indebted to you did you grant me a corner of your valuable journal for inserting this correction of your Milan correspondent's letter, which was, unintentionally I am sure, couched in terms of a nature to damage the prospects of a young artist most favourably known to Paris, and I doubt not soon to be better known in London. THE TWO SCHOOLS: GARCIA v. LAMPERTI. TO THE EDITOR OF THE " MUSICAL STANDARD." Sir,—It is at times instructive to observe rebellion. Millie. 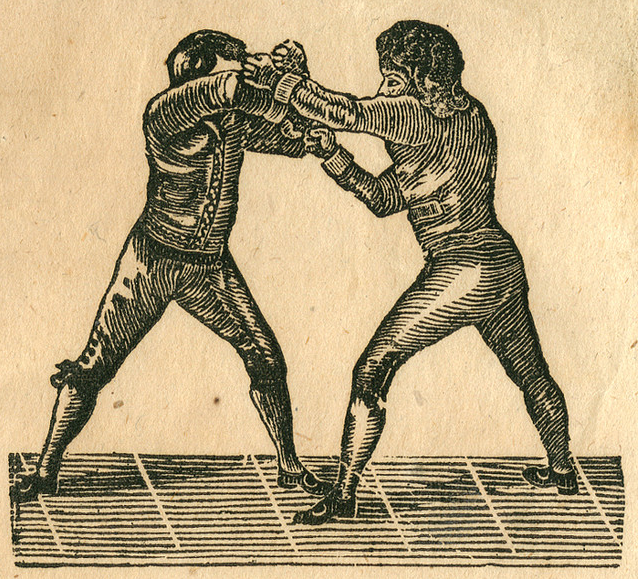 Rosavella's stern rejection of Signor Lamperti's school, and Mr. Meltzer's manly defence of such action, have deeper meaning than may at first appear. For it is only a student of the Garcia school who could so rebel. And the difference between the schools is this—The Garcia school appeals direct. It strengthens local weakness by concentrated nerve-force directed to enfeebled muscles in the larynx. The other school appeals to the chest, not to the larynx. It distributes nerve-force through all the muscular action of the chest—it strengthens chest power, it does not strengthen laryngeal power. Now we may divide singing masters into two classes, (1) those who do not attempt to change the voice (as Signor Sangiovanni), and (2) those who do attempt to change it. And of these latter we find (1) those who do something absolutely mischievous; (2) those who do something absolutely beneficent. And amongst the students of those who do something, we find, as though to increase confusion, wise and foolish, and these latter, if they do anything, are bound to get injury from whichever school they learn, either by the intrinsic wrong of the one, or by corrupted or perverted understanding of the other. So that it becomes a serious consideration whether the fault is with the school or with the scholar. But in this case we find a tested student, whose discernment could not well err, promptly rejecting as vicious a method which she felt and knew by experience to be "at direct variance” with her past culture. 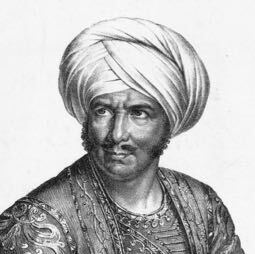 It is scarcely just for me to draw upon raw experience of boyhood years, but from what I heard of Signor Lamperti's pupils, I certainly thought his method based upon entirely false, and in great degree vicious, notions of voice. It was a deep repugnance felt at the modern Italian school that made me throw my uttermost energy into the scientific corroboration of Garcia's truths. It may be asked, if there be men who have unmerited repute as voice trainers, how has such repute been gained? The solution is easy. In Italy voices uncorrupted by spoken words abound, and in lesser degree in France and Spain, and in ever decreasing number in northern countries. "There is nothing so successful as success!" Men of musical ability, who have had the training of such voices in the art of song, are naturally tempted to undertake the training also of those not so unconsciously obedient to eternal physical law— they invent a method. The healthy ones flock to the reputable man, and succeed in spite of his method (this is on a par with persons in perfect health rushing to a physician because of his repute, and according to him the strength which nature gave), the disturbed ones fail, of course, but by failure are lost to observation. 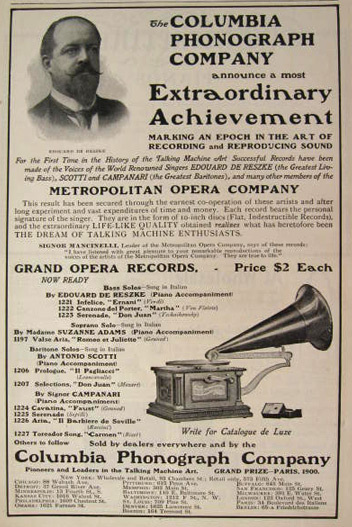 The number of singers that succeed under the men of greatest renown compared with the number these men have to train, is simply absurd in its smallness, and sufficiently proves that whatever musical power there may be the physiological processes for a right adjustment of the parts creating musical tone are calmly ignored. The test of a man's theory is found in his written words, not in the accidental support of the favored public, frequently blindly led by fashion. If any believer in the modern system of voice training can disprove my scientific support of the Garcia method, I shall be pleased to be converted, but till then I, as an onlooker of the conflicting schools, must feel delight at the present published rebellion, and express sympathy with the rebel. 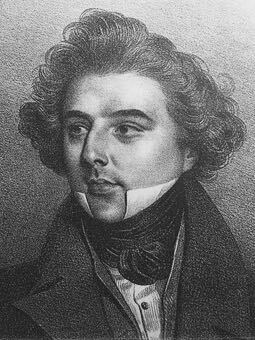 Edouard de Reszke was the younger brother of Jean de Reszke, and studied with his illustrious brother's voice teacher, an Italian tenor named Giovanni Sbriglia who was known for building up his student's chests. While Jean's voice ascended, Edouard's went the other way, and he become famous for singing bass roles like Gounod's Mefistofeles. The brothers often appeared together, as well as with their only sister Josephine before her untimely death at the age of 36. It was quite the operatic family. 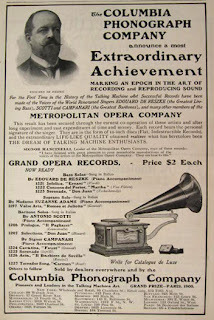 Three Columbia recordings were made of Edouard's voice, one of which can he heard on Utube, which I've included below. Alas, it is not the the aria from Martha where Eduoard sings a trill worth emulating. Which is a question worth asking: when was the last time you heard a bass execute an honest-to-god trill, where the two notes stayed within their bounds, had equal resonance, and spun around each other like dueling suns? Trill or no, the aria from Ernani in the Utube video below is revealing. Though it may be projection on my part, I hear the great bass as standing in front of Columbia's horn and being mindful of overblowing the machine: several phrases reveal a rich dark timbre that threaten to swamp the technology. Otherwise, de Reszke sings with a lightness and clarity - head voice actually - which is quite telling. No bellowing here. De Reszke's also has a nonchalance of delivery that is indicative a performer who is used to making grand statements in the theatre, not the small confines of a recording studio. As such, he doesn't seem concerned with the listener hearing how many times he breaths in a phrase, which often goes unnoticed in a large space. In short, De Reszke sounds like a stage animal with a huge presence that has been dragged in from the operatic jungle and tamed- if only momentarily. There is another thing about this recording that is worth pointing out only because it may be taken for granted by the student who is seeking to make a big impression. And that is de Reszke's vowels. Every one of them is as clear as a bell.